Throughout your guided tour of Southern Italy, you’ll visit royal residences, as well as ancient Greek archaeological marvels, before arriving in the Mediterranean-style town of Cellino San Marco. Welcome to Naples! At 6 pm, meet your Tour Director and traveling companions for a welcome dinner at your hotel. Discover the major sites of this fascinating city during your guided sightseeing this morning. See the remarkable Triumphal Arch of the New Castle, St. Charles Theater, Galleria Umberto, and the semicircular Piazza Plebiscito. The highlight is a visit to the magnificent PALAZZO REALE, royal residence of the Bourbons from 1734-1860. Since 1925, it also has housed the National Library. Afternoon and evening at leisure; join an optional excursion to make the most of your stay. Enter the region of Apulia, the heel of Italy’s “boot.” Enjoy a guided visit of the 13th-century, octagonal citadel CASTEL DEL MONTE, a UNESCO World Heritage Site, and considered by some as the most fascinating castle built by Emperor Frederick II. Arrive in the capital of Apulia, Bari, a port on the Adriatic Sea. Sightseeing with a Local Guide features a walk through the OLD TOWN, and a taste of the local focaccia. Next is attractive Ostuni, often called the “White Town,” a charming example of Mediterranean architecture. Its Old Town is located on top of a hill and fortified by ancient walls. Stay overnight on the beautiful and peaceful Tenute Al Bano Carrisi estate, situated in the Salento countryside. Savor local produce and wine from the estate’s vineyards, as well as olive oil and homemade pasta. Soak up the local atmosphere as you relax around the pool area. Arrive in Lecce, the “Florence of the South,” to discover the lacy stone buildings and baroque squares during your guided walking tour. Taste local pasticciotto and almond coffee. Enjoy time to explore the streets of the lovely center, before continuing to picturesque Otranto, an historic seaside town and port, surrounded by its imposing defensive walls and dominated by its romanesque cathedral. Return to Cellino San Marco. In Alberobello, follow your Local Guide for a visit to a TRULLO, one of the conical houses famous for their unique characteristics. The structure assures excellent indoor climate control—cool in summer and warm in winter. Continue to Castellana Grotte, where a visit to the underground CAVES, one of the most important attractions of the region, is included before heading to your hotel. Paestum, or Poseidonia, named in honor of the Greek god of the sea, was founded in the 6th century. During your visit of the ARCHAEOLOGICAL SITE with a Local Guide, see the ancient Greek temples dating back to 600-400 BC. Arrive in the charming, seaside resort of Sorrento. On an orientation walk with your Tour Director, see the old town's characteristic lava-stone streets, the 14th-century Sedil Dominova building, the ancient bell tower, and St. Antonio Church, dedicated to Sorrento's patron Saint. 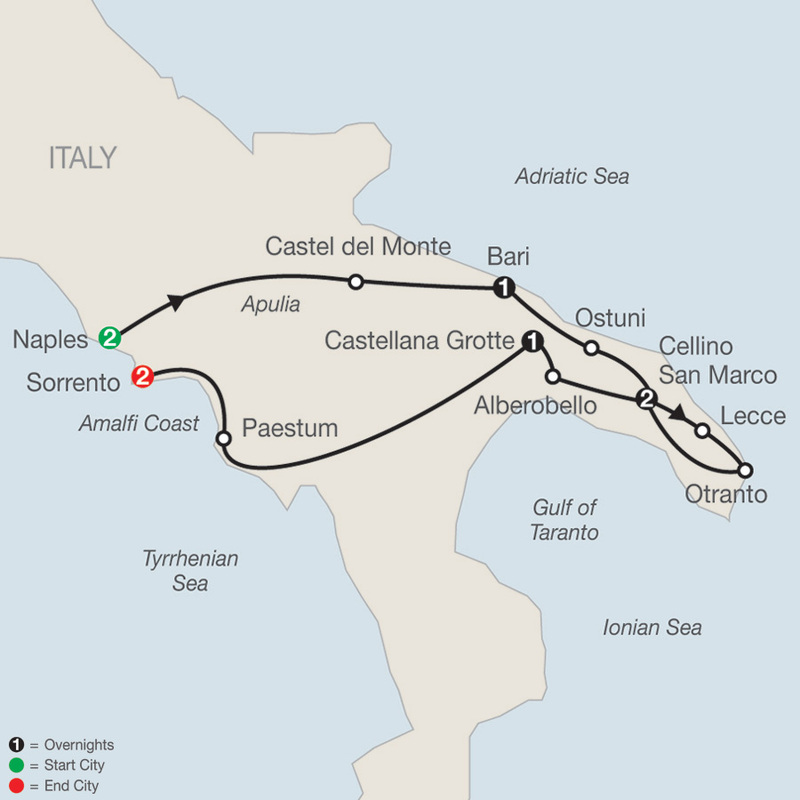 There is the opportunity to join an optional excursion to the Amalfi coast. 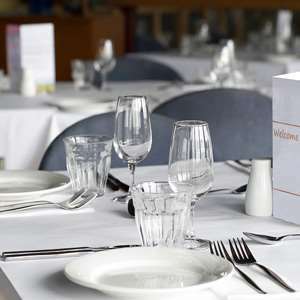 This evening, enjoy a farewell dinner at a local restaurant to celebrate your vacation. The quaint old town with its medieval structures and the breath-taking sea views make this a location worthy of a visit if you are in Puglia. Enjoy a delicious dinner on the picturesque bay of Naples. The Amalfi Drive is known to be the most spectacular road in Europe and the winding cliff- top road from Sorrento offers breathtaking panoramic views at every bend.